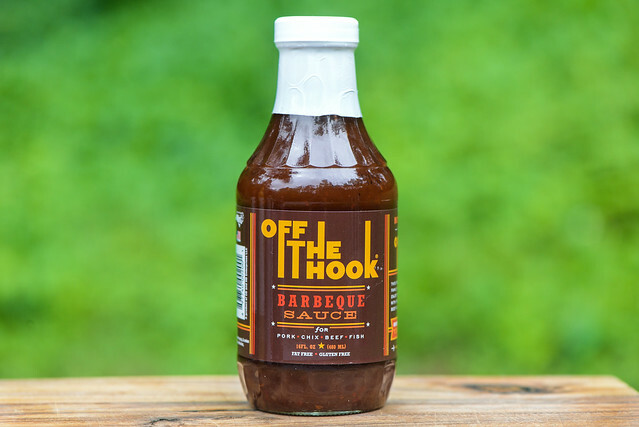 Off the Hook is a well balanced tangy and sweet North Carolina sauce with and extra hit of Worcestershire that adds a character that can stand out in a crowd. 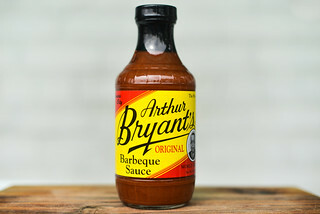 Carl Bridgers represents the third generation of his family to carry on the barbecue sauce tradition. 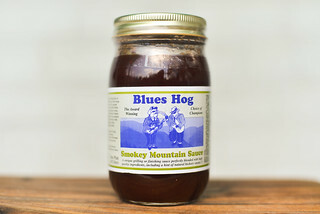 Through the years, his family's North Carolina-style sauce has been passed down and perfected, but it was Carl who finally brought it to market and came up with the name, which is both a nod to sauce itself and his personal love for fishing. 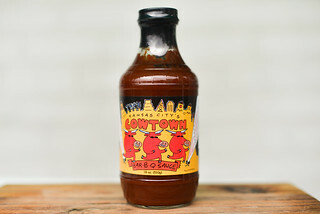 The sauce, which is produced in the Wilmington area, is available at groceries across North Carolina as well as online. There's no mistaking the strong vinegar in the aroma of this sauce, but it's nose tingling power is dialed back from a heavy does of sweetness that has a ketchup-like character. Also prevalent is complex Worcestershire, giving the sauce a lot of body that is elevated even more by a medium peppery heat as well. This red-orange sauce is super smooth and has a glossy sheen. It's semi-transparent, making it easy to see a lot of small red and black spice specs, along with a few larger white bits of spice here and there too. The sauce has a pretty thin consistancy, like a minimally thickening vinegar. This has it falling in a fast and even pour from suspended spoon, which ends with two or three fast drips, and then leaves almost no sauce left clinging to silverware. 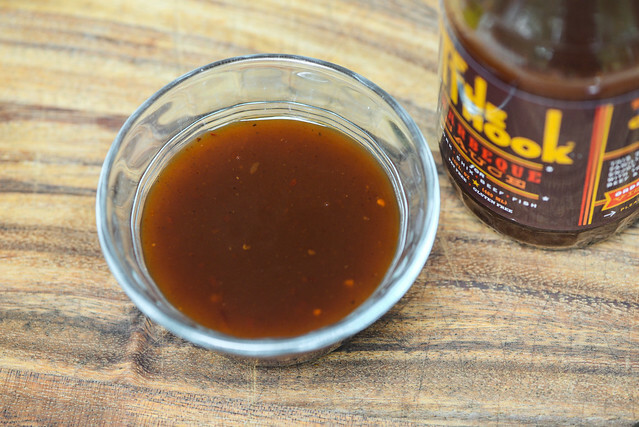 A sharp and tangy start to this sauce quickly gains a balance with an equally powerful amount of sugar. As the sauce begins to settle on the tongue, that sweetness gains a tomato flavor, giving the sauce a taste akin to extra tangy ketchup. Next, that heavy hand of Worcestershire makes a play, adding a real robust barbecue flavor, which becomes more layered as a peppery spice takes hold. As that heat increase, the sugars fade and the tang increases, leaving a final aftertaste that's tart and spicy. This sauce coated the chicken in a very thin and even coating that baked down well over indirect heat and took a few brushings before it began to pick up color. When moved directly over the coals, the chicken gained some light caramelization and suffered zero burn off. The flavor transformed to be mostly sweet. It was only after a few bites did the tanginess and slight heat start to make its way in, but both were minimal. This is a North Carolina sauce through and through. While it's produced in the East, it has a more Central/Western style with the addition of ketchup, which I think gives a nice sweet balance to vinegar. More notable though is the heavy use of Worcestershire, which really makes this a distinct and more robust Carolina specimen than most, certainly able to stand out in a crowd. Like most sauces with this type of thin consistancy, it's much better used as a dip or finishing sauce than as something to baste on while cooking. 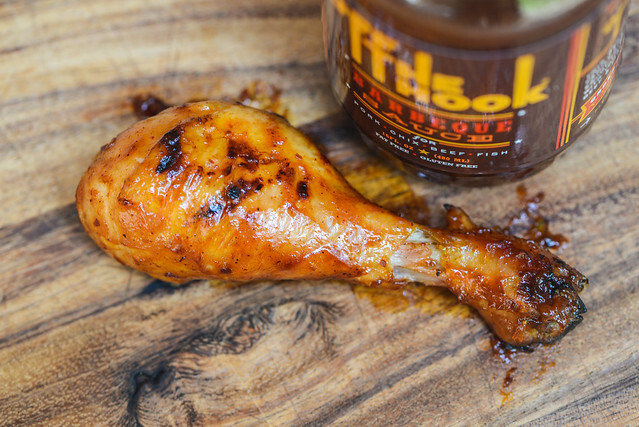 It would add a lot character to a pile of pulled pork out the jar, and the label promotes uses on chicken, beef, and fish too, all of which I recommend dipping into the sauce rather than brushing on while grilling to get its full potential. It is giving me the essence of condiments at home, thanks for sharing the recipe with us!